CNN and other news organizations were blocked today from a White House press briefing, reports CNN. 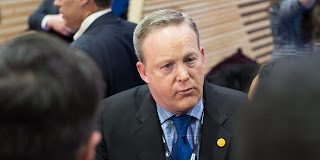 The New York Times, the Los Angeles Times, and Politico were also excluded from the meeting, which is known as a gaggle and is less formal than the televised Q-and-A session in the White House briefing room. The Associated Press and Time magazine boycotted the briefing because of how it was handled. The White House Correspondents Association is protesting. The conservative media organizations Breitbart News, The Washington Times and One America News Network were allowed in. Opposing views reporting on the government should be welcomed. Shutting down access to news organization, even those clearly biased and anti-Trump. is a very slippery slope. What should we expect next from this authoritarian administration? Note: At CPAC today, President Trump said that reporters "shouldn't be allowed" to use unnamed sources. I disagree here. In a vacuum, I agree that there should be a diversity of opinion and wide access. But NY Times, AP, etc., these organizations are the enemy of freedom and the people. They preach lies. They act in bad faith. Why grant them access? For decades they have lied and benefited from cozy government relationships. Now the hand that feeds is biting them. I celebrate that. And this post really singles out Trump for something all Presidents have done, just on the other side of the spectrum. I doubt Infowars and LewRockwell.com got direct access to Whitehouse briefings during the Clinton, Bush and Obama administrations. Trump killed crony TPP, gutted Obamacare including removing the truly authoritarian individual mandate, signed executive orders that directs the government to avoid taxpayer bailouts, re-examine all existing regulations, repeal 2 regulations for every 1 created, froze the hiring of federal employees, repealed forced transgender bathroom integration policy, and has triggered the horrible MSM to out itself. In a month. Quoting anonymous sources in news reporting has gotten out of control. There is a role for anonymous sources in news, however it should only be used when the source's safety or livelihood is at stake AND the information can be verified by documentation or multiple other sources. AND the target of the source's information should be given an opportunity to respond. Otherwise that source should only be used on background AND the reason he is not identified should be given with an explanation to the reader on how the information was independently verified AND any biases held by the anonymous source. That is not what the media have been doing. The media are carrying the water of the Deep State - the authoritarians of the past 50 years. This blog's Trump Derangement Syndrome is spiraling out of control. "CNN and other FAKE news organizations were blocked today from a White House press briefing" - fixed that for you. I disagree. Those media outlets are more harmful than terrorist organizations. They have colonized the kinds of the public, and lead them to hold ideas that impinge on the liberty of others.